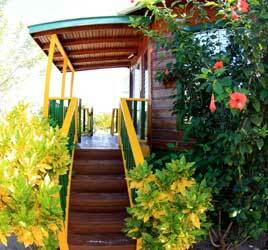 Pirate Islands Divers is pleased to offer several options for lodging in Cayos Cochinos. All of our rooms and accommodations face the cool northeast ocean breezes that make sleeping a pleasure in the Bay islands tropical climate. One of our options is to stay in the Garifuna Village of East End, located on the eastern face of Cayos Major. These are newly fabricated shared style rooms, with new beds, lots of windows for the breeze and shared bathroom amenities. These rooms have 8 beds each, perfect for groups of divers and vacationers. There is also a waterfront restaurant located adjacent to the rooms that serves throughout the day a variety of typical local foods and of course, fresh seafood! Another option available is there are several private properties in Cayos Cochinos for rent on a weekly basis. These are private homes/cabins suited to individuals/couples/families that prefer privacy. They have private beaches, private docks, etc and we can assist you in booking, travelling to and stocking these lovely secluded cabins/homes. Do keep in mind that by the same virtue the environment is relatively healthy, accommodation is not 5 Star resort style. Water and electricity are scarce in the Marine Park and we limit their use, as well as the ammount of chemicals introduced to the ecosystem. Consider staying in Cayos a divers outpost for remote scuba safaris! Please let us know the number of people that will be staying at the properties, when your intended dates are, what level of diving or scuba training you may want and we can assist you in booking a marvelously relaxing tropical Caribbean island vacation.